Dota is in everything now. I opened my fridge last week and found the bacon protecting itself against an onslaught of pork sausages. To relax from that hamagaddon, I sat down for a nice game of Minecraft, only to discover that somehow Dota has crept into it as well, via the Minecraft: Dota mod. 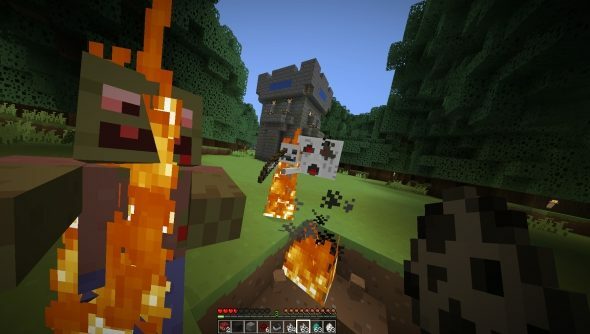 Minecraft: Dota is a multiplayer map that blockifies the current Big Thing, the action RPG mod of Warcraft that Valve, Riot and Blizzard are turning into a full game. Minecraft’s flexible framework has allowed the makers to set up a battle map, based on the League of Legends standard, for a 6-10 player PvP. All you need to do is download the map and join an enabled server. It’s an odd mix, not more Minecraft than Dota and vice versa: the basics of the action RPG are recognisable, even in first-person: you have the teams fighting to protect their bases at each corner of the maps. The level is symmetrically drawn, with the bases protected by baddie patrolled forests and powerful, creep spawning towers. That could easily be describing LoL, Dota 2, or the vicious ham wars currently taking place in my kitchen, but Minecraft caters for it with its own stylistic twists, although if you break a single block then that block’s soul will haunt you forever. At least that’s what the developers hope: it’s the one game mode of Minecraft that discourages block-breaking, because a Dota map is finely tuned thing. Zombies spawn from the towers that will to protect your base against aggressors, and typical Minecraft weapons of swords and bows are the weapons in your aresnal. Each base has a bank for you can save your character state when the inevitable Dota/Minecraft death occurs (take Dota deaths and multiply them by Minecraft’s: that’s how much you’ll die), and shops to spend your earned riches on more effective weapons, or wolfs. The lower view point allows for a few hidden areas within the forests, so you’re able to effectively ambush enemies by leaping out of the undergrowth with your buffed puppy. It really does fuse the elements of the two games together using a Redstone powered welding torch, although the frantic Dota game speed is less panic-driven. It’s compelling proof that Dota just works and that there’s little that can be transitioned into Notch’s adventure game. I can’t wait for someone to create Garry’s Mod in Minecraft. That would be hilarious.